A trip to Northeast India is incomplete without visiting the states of Manipur, Tripura, and Mizoram. Each state has its own set of tourist attractions which makes them worth the visit. This is part 4 of the Talk Travel Northeast India guide. First of all, ensure you have the permit to visit these states in Northeast India. Visiting any of the northeastern states requires some sort of permit issued by the Government of India. Get a permit beforehand so you don’t waste time procuring the permission to enter when you are on your way. Both domestic and foreign visitors need a permit to visit. Also, read this blog to get all your information regarding permits to visit these states. Manipur is considered as the bridge between India and Asia where a lot of ethnicities coexist peacefully. The capital of Manipur is Imphal. Manipur shares its border with Myanmar. Also, Manipur is famous for its arts and culture. 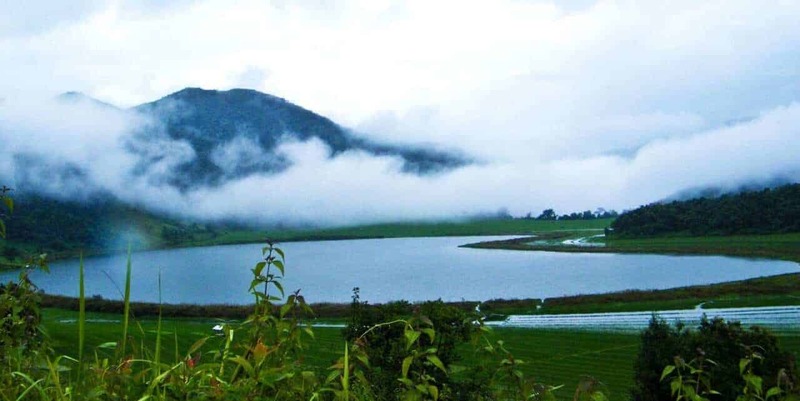 The best time to visit Manipur is from October to March. The Tulihal Airport outside Imphal has flights coming in from major cities like New Delhi, Mumbai, Kolkata, Guwahati, and more. Certainly reaching Manipur by flight is the right decision. The nearest and the largest railway station is the one in Guwahati (Assam). You can take a bus from Guwahati to Imphal. There are a lot of private buses which ply between Guwahati, Silchar (Assam), Dimapur (Nagaland) and Imphal. This is a bustling bazaar like any other market in the world. It has traders selling spices, textiles, handmade jewelry, fresh fruits, and vegetables. What makes this place special is that all the traders are only women. 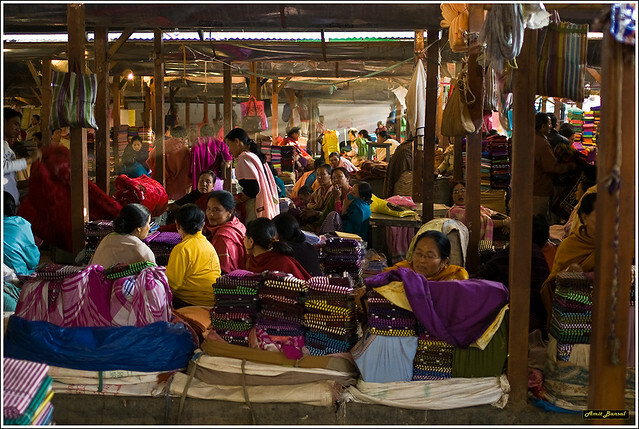 Located in Imphal, Ima Keithel translates to mother’s market. There are a lot of rivers that flow in the hills that surround Imphal which culminate to create a valley. As a result, there are numerous lakes, swampy areas and marshes in the Valley. 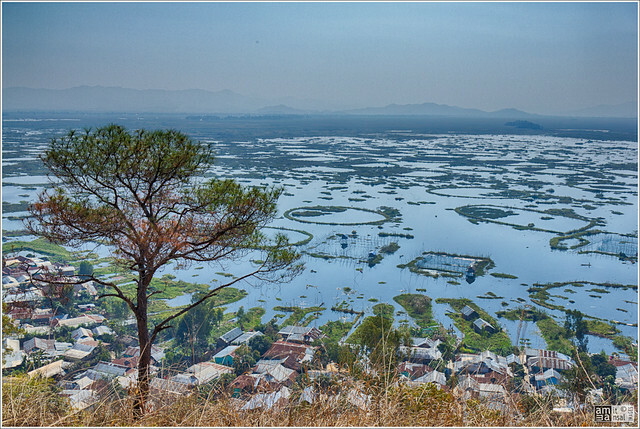 The most famous of the lakes in the area is the Loktak Lake. 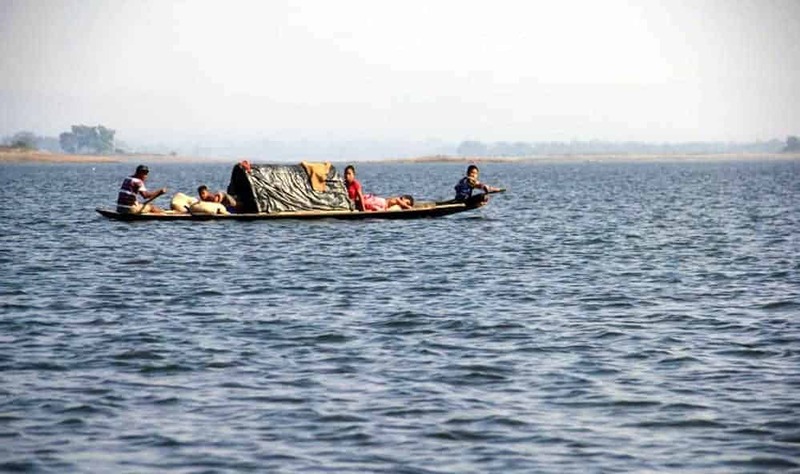 This is the largest freshwater lake in Northeast India. Above all, what makes this place unique are the circular floating swamps called phumdis (tiny islands). You can travel to Bishnupur district is a cab which is 53 km from Imphal. The most important fact is that this lake is a source of livelihood for the local people. Locals depend on the lake for fishing, irrigation, drinking water supply, and hydropower generation. Also, there is the Keibul Lamjao National Park located at the southwestern part of the lake. It is home to the endangered Manipuri brow-antlered deer, Sangai. It is a very important historical and archeological site of Manipur. It was the ancient capital of the Manipur Kingdom. Go back in time and learn about the valorous days of the Manipur kingdom. Visit the fort, citadel, temple, and museum all built within the walls of this fort. Read more about this fort here. Andro village is 30 km from Imphal on the foothills of Nongmaiching hill. Most noteworthy fact about this place is that it is famous for the traditional pottery skills of its people. The Santhei Natural Park is a popular picnic spot for locals and tourists alike. This park has been developed around a water reservoir. Another major attraction here is the Mutua Cultural Heritage Complex that showcases major tribal tradition and their artifacts. The Chakpa Panam Ningthou Meithoupirol Shanglen is another interesting destination that attracts a large number of visitors. It is an old Hindu temple where a sacred fire was lit 1,000 years ago. Interestingly, the fire has been preserved and maintained until now by the local community. It is a town located on the India-Myanmar border in the Tengnoupal district in Manipur. Indians are allowed to enter Myanmar without a visa. But all Indian tourists need to return back to India before sunset. This place is famous because the British and the Japanese forces fought a fierce battle against each other here during the Second World War. Lt. General Iwaichi Fujiwara, a Japanese veteran constructed ‘The India Peace Memorial’ to commemorate the death of Japanese soldiers who lost their lives in this battle. This place was inaugurated in 1994. It is located on Kheba hill 35 km from Imphal on the Indo-Myanmar road. This is a memorial built to reminiscence the past heroic deeds of Manipuri warriors. It is dedicated to one of the warriors of the state, Paona Brajabasi and other warriors who fought against the British Army at the Khongjom battlefield of 1891. A grand 30-feet tall gate will welcome you to this place. The State Tourism Department organizes a tourism festival between 21st and 30th of November every year. This festival is a big platform for Manipur to showcase its rich tradition and culture. Also, it promotes Manipur as a world-class tourist destination. Consequently, this is the best place to know about Manipur’s cuisine, dance forms, indigenous sports, adventure activities and more. It is one of the smallest states located in the southernmost point of Northeast India. Christianity is the predominant religion here. 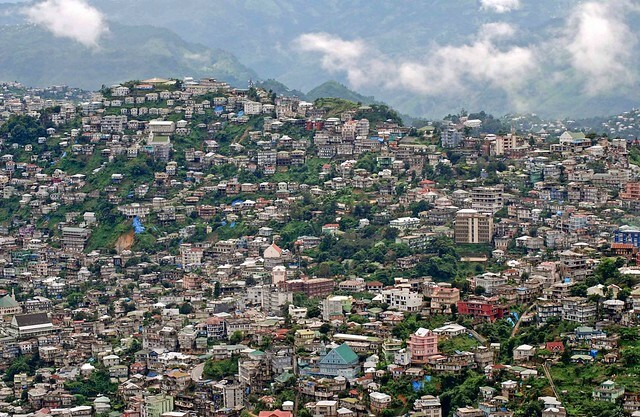 Interestingly, the Tropic of Cancer passes through Aizawl, the capital of Mizoram. Mizoram is a destination with a wide array of festivals, dances, handicrafts, flora and fauna, breathtaking natural beauty, and temperate climate. 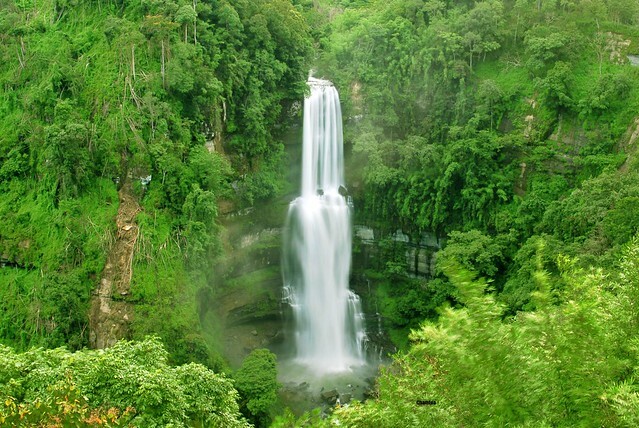 Mizoram has a lot of natural touristic attractions. This place makes for a perfect and a pleasant holiday away from the humdrum of city life. Lengpui Airport in Aizawl has connectivity with Kolkata and Guwahati only. You can take a cab for 600 INR (9USD) from the airport to the city center. Furthermore, you can take a shared cab for half the price. Taking a train to reach all the way to Mizoram is not recommended. The best way to travel is by road from popular cities nearby like Guwahati or Silchar in Assam. Perfect for a picnic, Tam Dil is a reservoir located 64 km from Aizawl. It is considered the largest lake in Mizoram. Tucked between evergreen forests and hills, you can visit this place to witness pristine blue waters and lush greenery. Besides being a tourist destination, Tamdil Lake is also very crucial for the fisherman in the locality. This pristine waterfall looks like a stream of gushing milk falling from a cliff surrounded by emerald green trees. It is located 137 km away from Aizawl. Also, it’s a two-tiered waterfall with a total height of 750 ft. It is difficult to get close to it because of the sheer forested hillside. However, a comfortable viewing tower has been constructed. This town is on the Indo-Myanmar border located 200 km from Aizawl. Head to this place to enjoy the stunning vista of emerald rice fields bordered by the smoky hills of Myanmar. Besides that, Champai has the biggest stretch of plains in Mizoram which is used for rice cultivation. It is a beautiful plateau on a craggy hill at Vaphai village, which is about 86 km from Champhai. Therefore, a visit to this plateau is indeed an exciting and thrilling experience. 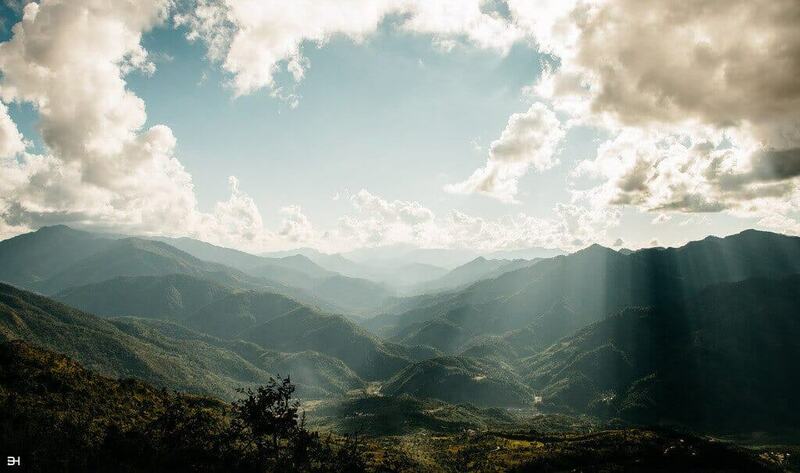 This is a mountain range in Mizoram and Tripura, a neighboring state in Northeast India. Phawngpui, also known as the Blue Mountain is the highest peak in this range. There are many species of butterflies here, including some rare species found in this region. These hills are inhabited by the Lushais and other Mizo tribes. Also, Lushai Hills is great for hiking at all times of the year. We would recommend not to go during monsoon because the path can be very slippery and hence risky. It is a natural heart-shaped lake located in the northwestern Chin State of Myanmar. You can reach this place from Champhai. Catch an auto from Govt lodge to reach Champhai bazaar and you need to reserve a seat in a shared SUV which leaves for Zokhawthar which is in Myanmar. Start on this adventure early in the morning as you have to rely on this SUV to travel. Likewise, you can hire a cab from Champai and travel at your comfort instead of relying on the shared cab. Apparently, a lot of newlyweds from Mizoram cross the border and take pictures at Rih Dil. Reiek is a mountain and tourist spot 29 km from Aizawl. It rests at an elevation of 1,548 m overlooking Aizawl and offers a view of the surrounding valleys and hills. There is four well-furnished government cottage there to rest for the night. Above all, it costs just 400 INR (7 USD) per day. Our recommendation is to book it in advance. There is a small trek up the mountain from the model Mozo village, which one must do. It takes you to the top of the mountain. The views you get from the cliff of the valley below you is unmatchable. This is a hilly state in Northeast India surrounded by Bangladesh on three sides. It is one of the regions least explored by tourists. Most importantly, Tripura offers immense natural beauty and an intriguing cultural heritage. Maharaja Bir Bikram Airport in Agartala, the capital of Tripura has flight connections from New Delhi, Kolkata, Guwahati, and Silchar. Flying is the most convenient way of travel. The fastest way to travel internally in Tripura is by a helicopter that connects Agartala with the northern parts of the state. It’s easy to use train services to get here. Also, an Express train runs daily between Agartala and Lumding. The landscape that you see during the journey enhances your experience of Tripura. You have to book the tickets in advance since it’s a popular way to get there. 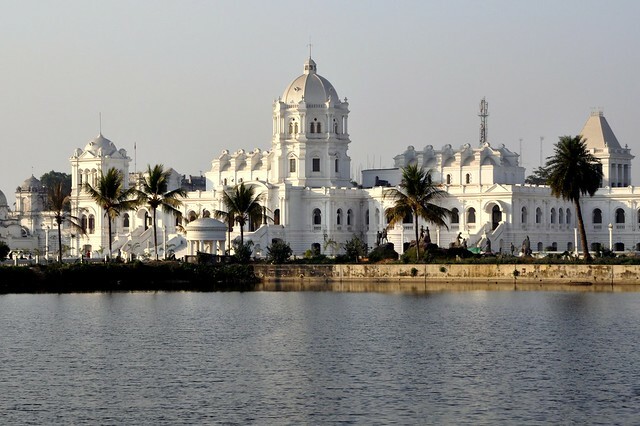 The Ujjayanta Palace is a museum and the former palace of the Kingdom of Tripura constructed between 1899 and 1901. The palace stands on the banks of two lakes surrounded by Mughal style gardens. Above all, this Palace is one of the largest museums in Northeast India, covering an area of 800 acres. Literally meaning the Water Palace, it is a former royal palace. King Bir Bikram Kishore Manikya Bahadur of the erstwhile Kingdom of Tripura built it. 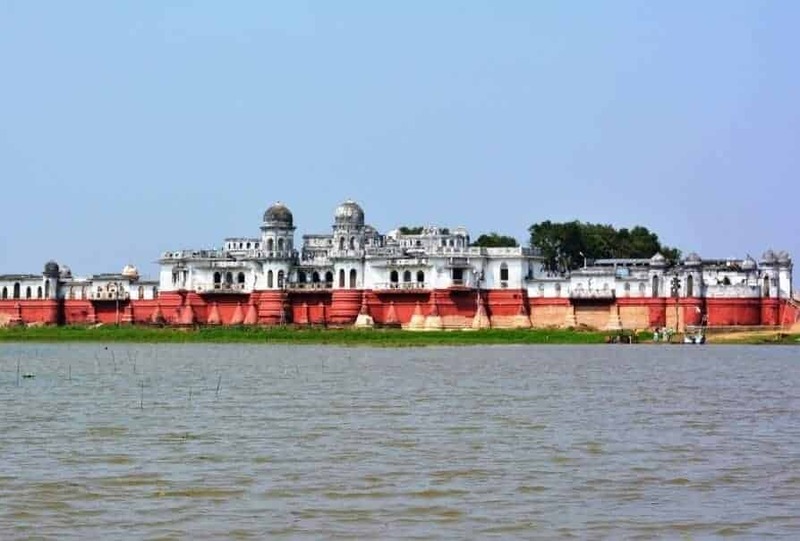 Neermahal in the state of Tripura in Northeast India. It is built in the middle of the Rudrasagar Lake. Every year in the month of August, the government organizes the Neermahal Water Festival that lasts for 3 days. There are many cultural programmes and events that you can go to. Furthermore, the biggest attraction of this festival is certainly the boat race at Rudrasagar Lake. In the thick forested Jampui hills of north Tripura, bound by the meandering Manu River there are giant bas-relief sculptures which make Unakoti a must-visit landmark. 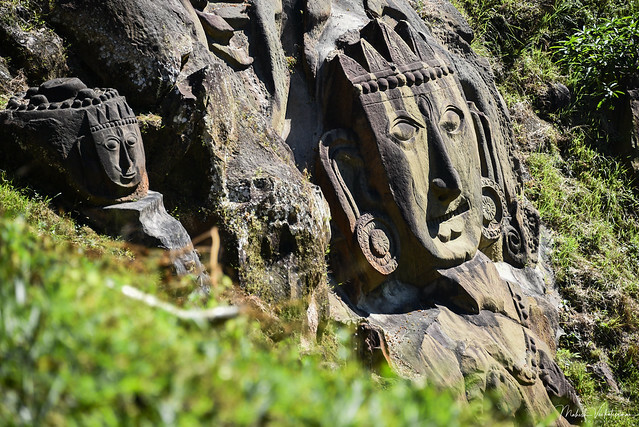 Located around 178 km from Agartala, Unakoti’s ‘Lost Hill of Faces’ is a centuries-old Shaivite pilgrimage spot. Unakoti literally meaning one less than a koti (crore) in Bengali. The most famous one of them is the Unakotishwara Kal Bhairav, a 30-foot high carving of Shiva’s head. Similarly, the most eye-catching feature is its 10-foot high intricate headdress. A warrior-like Goddess Durga and Goddess Ganga flank it. Read more about this great place here. This wildlife sanctuary is located 25 km from Agartala. It is a woodland with an artificial lake and gardens. What is noteworthy about this place is that you can find orchids, elephant joy rides, boating facilities, rubber, and coffee plantations attracting tourists all through the year. The Clouded Leopard National Park is also located inside the Sipahijola Wildlife Sanctuary. There are other wildlife sanctuaries that you can visit like Trishna, Gumti, and Rowa which are thriving with the local flora and fauna. If you love pineapples, then this is the place for you. Kumarghat is in North Tripura District of Tripura. It is famous for its extensive pineapple cultivation. Kumarghat in Tripura is the highest producer of the fruit in the state. Kumarghat supplies large quantity of pineapples to Assam and other neighboring states in Northeast India. Situated in Amarpur subdivision, about 120 km away from the capital city of Agartala, this lake is a confluence of the Rivers Raima and Sarma. Beautiful hills and lush greenery surround the lake. You can also find villagers fishing here. There is an ecotourism company called The Greener Pastures completely dedicated to promoting sustainable travel in Northeast India. They promote tours and adventures to exotic locations in the northeast with an objective to benefit local communities and safeguard the environment with responsible travel. Furthermore, they conduct guided tours in this region which will give you a great insight into the lives of the people, culture, heritage, and landscape of this region. We hope this guide helped you in getting a fair picture of what places to visit in Manipur, Tripura, and Mizoram. Read Part 1, Part 2, and Part 3 to explore other fantastic locations in the northeast of India.